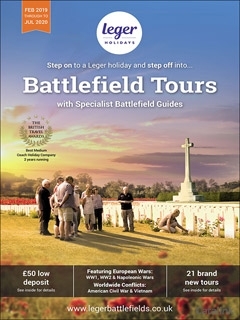 You can download the Battlefield Tours by Leger Holidays Brochure instantly as a digital iBrochure [?]. View the Battlefield Tours by Leger Holidays Online Brochure Now! Follow in the footsteps of heroes, on a Leger Holidays Battlefield Tour with specialist guides. Request the digital brochure today and get full information on some of the most compelling tours available. Journey through time on a trip you'll never forget visiting the battlefield sites and the places where history was made. Leger is the UK leader in escorted Battlefield tours, with the widest range of tours, departure dates and choice of over 490 local coach joining points. There's top-rated guides on every trip making it easy for you to get the full Battlefield Tour experience. Choose from more than 75 World War 1 and World War 2, Napoleonic and American Civil War battlefield tours including All Quiet on the Western Front and D-Day Landings in Normandy and as the perfect introductory tours to WWI and WWII. Leger Battlefield tours are truly inspirational journeys of remembrance and discovery. Request the Digital Brochure today for more information. You will find Eden in a tranquil corner of Cumbria &#8211; one of Englands most beautiful counties and a lovely destination for a holiday at any time of year. The clean air and dramatic landscapes will refresh, inspire and rejuvenate anyone who visits.